Science teachers today have their hands and schedules full teaching science content to prepare students for the future. Some kids may be interested, some not, but either way they have to learn the basics. It is difficult to teach content and get kids excited at the same time, but with the help of The Inventor Mentor students excitement for science and invention will be sparked, and they ‘ll learn you can do some really neat things with a good science education. The Inventor Mentor has been performing science demos for elementary and middle school students for the past 8 years. His demonstrations shed dramatic light on such questions as how and why smoke rings form, the science of sound, Newton’s laws at work (e.g. in the Kid Launcher! It’s less worrisome than it sounds…), and how we see. Open kids eyes to the amazing world of physics and invention!! Join Terry as he takes you on a high-energy, interactive journey through his vast menagerie of fun and unique inventions developed over the course of his 15 years of inspiring young inventors!! Start your adventure watching huge soap film bubbles float over your head or perhaps being one of the lucky few that experiences the inside of a bubble!! Learn the physics behind fog rings and see what can be accomplished when 2000 straws are placed over an industrial fan!! Be amazed by levitating balls, flying cereal, and an actual hovercraft!! 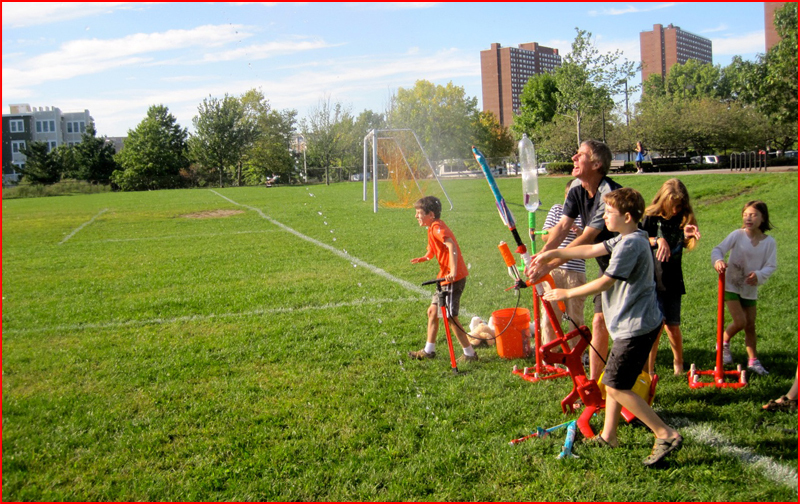 Young minds will be inspired as Terry, with the help of volunteers, demonstrates the invention process with a series of marshmallow launchers and stomp rockets culminating in his high pressure air tube and water bottle rockets!! Students won’t forget this exciting and memorable event!! Physics concepts covered include flight, forces, air pressure, and Bernoulli. In this workshop, students are guided through the invention process; from generating ideas to designing and building inventions. Through a few sessions their ideas are brought to reality. Students will actively learn to problem solve and put their scientific understanding to work. Six week sessions are recommended, although single workshops are also available. Interactive workshop building air rockets, soda bottle rockets, and gliders. From this workshop, students learn all about the design process while building and launching variations of these airborne inventions. Six week sessions are recommended, although single workshops are also available. Each session is tailored specifically to age range and curriculum of the participating classes, ranging from grades 3 – 12.